Hi Jeet. I acknowledge I’m not as smart as you. But I do know that what I wrote in the Post was not a death threat. A death threat is when you threaten to kill someone — and, under law, the threat must be credible and imminent. I didn’t threaten to kill anybody, and never have. President Obama should catch and prosecute Assange for espionage and other offences. But it’s pretty clear that Obama lacks the political will to do so — if he’ll spring a murdering terrorist like Omar Khadr in a plea deal, I doubt he’ll have the tenacity to prosecute Assange, especially when the New York Times is in league with him. So I do think than an extra-judicial killing would be more likely. Obama has dramatically increased the use of Predator drones for targeted assassinations. That seems to be his style. I know that none of this suits you. But it’s a war and Assange has made it clear that he’s on the other side. Perhaps you might be motivated by more liberal goals, such as stopping Assange from revealing the identities of dissident journalists, as he has done to reporters in Venezuela and Algeria. If you don’t care about national security for the West, perhaps you’d care for the lives of human rights activists in the Third World. Shorter Ezra Levant: Obama made me write a column urging the extra-judicial execution of a citizen for a crime he hasn’t yet been convicted of. I guess the ethics of personal responsibility don’t extend to columnists. I’ll leave it to lawyers to decide whether Ezra’s column of last Tuesday was technically a death threat or not. But whatever its legal status, morally his remarks calling for the assassination of Assange are the equivalent of a death threat. “Assange and his colleagues act like spies, not journalists. WikiLeaks could have its assets seized, just like the Taliban has. And U.S. President Barack Obama could do what he’s doing to the Taliban throughout the world. So these are not words calling for Assange to be caught or prosecuted (Ezra of last Tuesday specifically said that’s not what should be done). These are words calling for war, that is to say for the state to use violence against private citizens who live all over the world who have not yet been convicted of any offence related to this incident. Does Ezra really think that his words of a few days ago, which are widely available on the internet, will be so quickly forgotten? I do regret the snooty tone of this post and my comments about Ezra’s intelligence. In the words of Tom Flanagan, I was being too “glib.” But Ezra can’t go around calling for a private citizen to be killed and not expect some angry pushback. While I think threats of political violence should be called out, I’m not sure how good the ROI on doing so actually is. I read, with some interest, your column about Pegler, in part because I thought the earliest example (read about second-hand in Walker Percy’s excellent work of non-fiction, Lost In The Cosmos, was this weird little play written by a bunch “New Left” polemicists wherein then President Johnson does something unprintable to JFK’s head wound. And that’s the thing that Pegler, Coulter, and those “New Left” polemicists all have in common: they are bloodless freaks who pretty much preach to the converted and experience diminishing returns from their extreme political rhetoric over time because that’s all they have going for them. I’m sure at some point, even the Bircher’s just want to call it a day and either go home to their wives or go bowling. No matter what I think about Mark Steyn’s or Jeet Heer’s political views, I’ll always think that Steyn is a crack theater critic and Heer is a brilliant literary critic, and I’ll always read their work with interest because of the interesting “outsider” perspective they bring to the politcal beat. If I don’t agree with Coulter…well…I guess she was kinda attractive when she was on Maher’s show back in the late nineties. 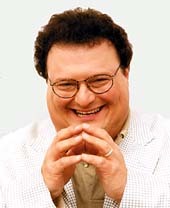 Thanks for your half-apology for the insults, and I’ll let the fat picture of Newman pass, because I know that’s probably you just projecting. Not only did I not make a death threat in my column, but I didn’t call for the killing of Assange either; I simply asked why he wasn’t killed already and pointed out that Obama has ordered the targeted killing of many people, including U.S. citizens. Of course, if Assange ever did live up to the original mandate of Wikileaks, and shine the light of scrutiny on regimes like Russia, China, various in Arabia, etc., he’d be dead by now. Which is less fun than hustling Swedish chicks in 5-star hotels, and then scramming when the cops come. I do think a prosecution is in order; Krauthammer makes a good case for that, and other legal responses. But I’m not opposed to a targeted killing of Assange. He’s a spy for the enemy during a time of war, he’s doing real damage (Krauthammer points out the Yemen disaster), and pledges to do more imminently. I don’t believe in prosecuting a war through lawyers instead of soldiers; I don’t believe in weighing to a nicety the way in which we defend ourselves against sworn enemies. And Assange is that. A prosecution, a Predator drone, whatever. Given Obama’s timidity, the drone is more likely to happen. And, yeah, I do think the New York Times and the Guardian should face espionage and treason charges. Ezra: The Newman photo was just a tribute to Frank magazine. I’ll take it down if you find it offensive you the joke didn’t originate with me and really has nothing to do with fatness or physical appearance. It’s more about character. In any case, it’s odd to me that you can get so dainty about a Seinfeld joke while also calling for the killing of civilians. A few sentences later you say something completely different: “But I’m not opposed to a targeted killing of Assange….. I don’t believe in prosecuting a war through lawyers instead of soldiers; I don’t believe in weighing to a nicety the way in which we defend ourselves against sworn enemies. And Assange is that. I’m sorry but you don’t seem to understand the plain and clear meaning of your own words — and the way you contradict yourself in the space of a few sentences. It’s impossible to read what you wrote and not conclude that you want Assange dead. To not see a difference between a legal prosecution and a Predator drone, or to prefer a Predator drone to a prosecution, suggests a degree of moral blindness that I find utterly baffling. You’ve forced me to take Levant’s side in an argument, something I find quite disquieting. Calling on someone to be killed by another country’s army is not a death threat. A death threat quite strictly implies the direct means to force the death. If Ezra had said, “I will kill you,” that would be a death threat. “I hope the US kills you” is not, unless you are, say, head of the Joint Chiefs. I am really surprised this needs to be spelled out to someone as sharp in matters of literary distinction as you. Secondly, Levant is not saying he sees no difference between prosecution and killing as you claim. He is quite specific that in matters of war he prefers killing. Instead of staking a position you can handle, such as explaining WHY you don’t think Assange should be blowed up, or why you do or don’t think he should be prosecuted (ie the meat of this issue) you are manipulating someone else’s words for an irrelevant side argument, and you’re not doing it fairly. Now please don’t ever put me in this position again! But this position only makes sense if we agree with Levant that there is no difference between Assange and a member of the Taliban. That’s surely an assumption that not everyone shares. As I’ve repeatedly said, Assange and his colleagues are citizens who have not yet been arrested, let alone convicted, of any crime for their work on Wikileaks. To suddenly call on either the United States army or the CIA to kill them seems … what’s the word I’m looking for … a tad premature. If Assange has committed a crime he should be arrested, and if found guilty, punished. There is of course a warrant for his arrest but it’s on a separate matter (a suspiciously trumped up looking matter, I have to say). But it is interesting that there is not even a warrant for his Wikileaks activities. To use a historical analogy: back in the early 1960s the Kennedy administration was very angry at Canadian Prime Minister John Diefenbaker for his unwillingness to co-operate with American foreign policy. This was a period where the CIA was actively supporting coups and assassination plots against perceived enemies and even un-cooperative allies (i.e., Patrice Lumumba and Ngo Dinh Diem). Suppose some Canadian columnist (as passionate about anti-communism as Levant is about the war on terror) wrote a column asking “Why hasn’t the CIA killed John Diefenbaker yet? He is not anti-nuclear or a neutralist, he’s on the other side. We’re at war with the Soviet Union and Diefenbaker is helping their cause. Why is he still alive?” This hypothetical columnist would have been regarded as a thuggish lunatic. As I said above, legally what Ezra wrote might not constitute a death threat. But morally it has the same meaning and intent as a death threat. Ezra wants to use the threat of violence intimidate people whose political activities he doesn’t like. That’s a pretty amazing thing to do, although as I pointed out in my National Post column it has precedence among some of the more hair-raising voices of the far right. Just as we have a presumption of innocence in our legal system, surely there is also a presumption that people shouldn’t be killed unless under extraordinary circumstances (such as immediate endangerment). So I don’t think the burden is on me to show why Assange shouldn’t be assassinated. The burden is on the advocates of assassination to show why it’s a good idea to kill someone who, to this point has been arrested for no crime with regards to Wikileaks, should be subjected to threats of violence in the media.